Extract MySQL database items to the other database automatically. Extract MySQL database items to the other database automatically, ability to choose extract table structure or table records, select any items of MySQL database and automatically extract the newly-created MySQL database items. Automatic Backup Scheduler for MySQL > Tutorials > Extract MySQL database items to the other database automatically. Automatic Backup Scheduler for MySQL can help you extract MySQL database items to another remote or local MySQL database, you can choose to extract table structure or table records easily. It ability to select any items of MySQL database and automatically extract the newly-created MySQL database items. You can extract the MySQL items to an existent database or create a new database with MACRO viaiables ervery time. Step 1: Download and install the software. Please download and install the software Automatic Backup Scheduler for MySQL. Step 2: Launch the software and create a task to Back up a MySQL database to the other database. Launch the software Automatic Backup Scheduler for MySQL. Create a task to Back up a MySQL database to the other database. Enter the name of the task on Step 1 of the Task Wizard. Enter the information of the source MySQL server and database on Step 2 of the Task Wizard and click Next. 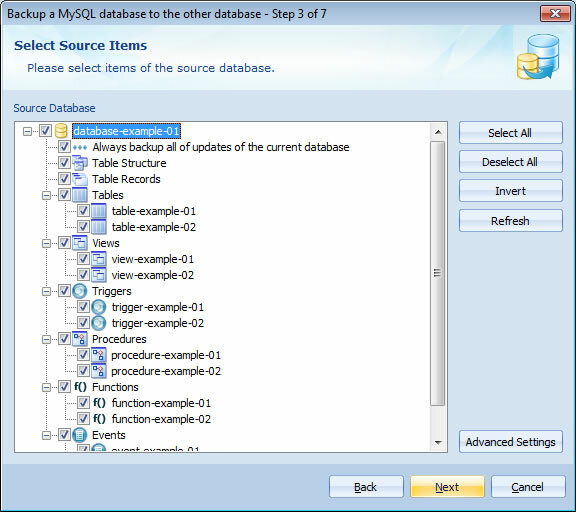 Step 3: Select the items of the source database which you want to extract. Please select the items of the source database which you want to extract and set up the advanced options on Step 3 of the Task Wizard and click Next. If you want to extract the newly created items or remove the dropped items from the source database list of the task, please check the option Always back up all of updates of the current database, you don't need to edit the task manually. If you want to extract the structure of the selected tables, please check the option Table Structure, the software will extract the CREATE table statements. If you want to extract the records of the selected tables, please check the option Table Records, the software will extract the INSERT statements. 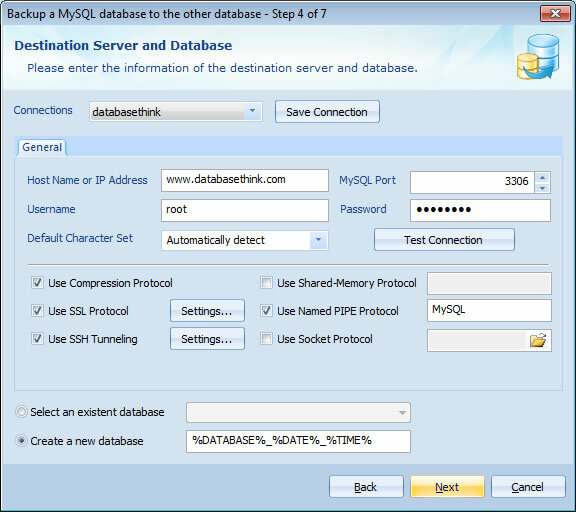 Step 4: Connect the MySQL server of destination database. Please enter the information of the destination MySQL server and select or enter the database which you want to extract to. Select an existent database to store the extracted data. If your want to select an existent database on the destination MySQL server to store the extracted data, please check the option Select an existent database, click the arrow to select a database or enter an existent database name. ( Case Sensitive ). Automatically create a new database to store the extracted data. If you want to create a new database to store the extracted data, please check the option Create a new database. You can enter a database name or use the MACRO variables to create a new database every time. Please ensure the name is different from any existent databases. The current MySQL user must have enough privileges to create a database on the destination MySQL server. Step 5: Click Next and follow the Task Wizard to finish the task creation. Please click Next and choose the Task Scheduler for running the task on Step 6 of Task Wizard to extract MySQL databases on schedule. Click Finish on Step 7 of Task Wizard to finish the task creation. That's all. The software will automatically extract the MySQL database items to the remote or local destination MySQL server.